Zyuden Sentai Kyoryuger Brave Voice Cast Announced! Toei has opened their official page for the upcoming special series Zyuden Sentai Kyoryuger Brave– a dub of South Korea’s new Power Rangers Dino Force Brave. *Shigeru Chiba as the series’ Narrator. Furthermore, actor Yamato Kinjo (who played Nossan/Kyoryu Blue in the original series) will take on the role of Brave Kyoryu Black! Zyuden Sentai Kyoryuger Brave will begin streaming in Japan on April 14, 2017! Be sure to join in our Ongoing Discussion Thread to share your thoughts & fears about this exciting new project! 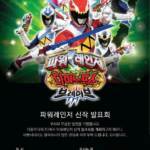 Korea to Produce New Kyoryuger Episodes and Stage Shows? Zyuden Sentai Kyoryuger may have finished it’s run in Korea(which aired dubbed under the Power Rangers Dino Force name) but with it’s success in that region, it seems that Korea is set to adapt it’s own second season and new series of stage shows. 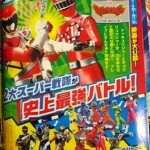 New suits for the Rangers have been created, in addition there’ll be a new power up for Kyoryujin and production photos which came out last year reveal a modified Aigaron suit. Details on this new season are currently scares, so we have no clue if any of the original actors will be returning or if the production will be moving forward with it’s own cast. 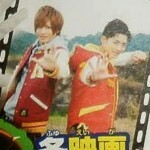 Stay tuned, and Tokunation will provide more info on this as it becomes avalaible. Thanks to an article posted by tokusatsunetwork.com, we now know that the title of this 12 episode series will be called Power Rangers Dino Force Brave, and it’ll be the first Korean Power Rangers adaptation. 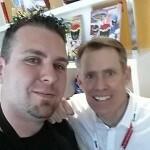 Back at this year’s San Diego Comic Con 2015, we were invited by Saban Brands to come meet the cast of Power Rangers Dino Charge and interview the executive producer of the series, Chip Lynn. Jumping at the first available opportunity to do so, we booked our interview appointment and sat in anticipation until it was time. And we did our absolute best not to disappoint you with “easy questions”, instead going right after the hard ones! That was new footage of Zeltrax in the Dino Super Charge trailer. We point it out to Chip. He reacts. We also ask him about the Talon Ranger. He won’t give us an answer, but he does give us a clue. But does that mean we’ll be seeing him in the show? Listen on and find out! As always, you can choose to directly download the .MP3 of the interview. It’s only about 11 to 12 minutes in length. We do apologize for the audio quality – throw 25 people in to a room with an incredibly loud cast (they’re awesome!) and you’ll have an audio-editing nightmare on your hands. We’d like to thank Chip Lynn for being such a great interview guest, as well as Saban Brands and all of their crew for always being so courteous, professional, and just an overall joy to work with. The franchise is in very, very good hands right now. This interview only cemented that thought. For reactions and to read the transcript of the interview, simply click here for the transcript. Thanks for listening! Please leave your feedback in the thread. This one is a little out of the ordinary for us but it was still pretty awesome either way. During San Diego Comic Con 2015 we spent a lot of time chatting with Bandai America, both casually and on the record about the future of the franchise and so forth (click here to see our on-the-record interview!). One of the cool things they mentioned was that the Dino Charge Megazord that has been at all their booths during this year’s convention cycle is the actual Kyoryuzin suit used in Zyuden Sentai Kyoryuger! 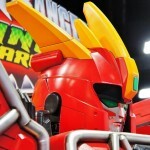 That’s right – Bandai America paid to have Toei ship the suit for Bandai America to show off during the convention cycle. You know what that means? Remember the image of our own Sentai Tamashii holding the Dino Charge Megazord sword at this year’s Toy Fair? It means he was holding the screen-used weapon from Kyoryuger. So if you’re headed to New York Comic Con 2015 this year, be sure to reach out and gently touch this awesome piece that will one day find its way back to Toei for storage in the museum! 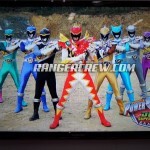 Licensing Expo 2015 is well underway and while we’ve had a few snippets of information leak out, we just got some significant reveals courtesy of Saban Brands Entertainment’s very own Marketing Teaser for Power Rangers Dino Super Charge! Photos courtesy of Rangercrew who are currently in attendance! The images from the teaser give us a lot of food for thought with the upcoming 2016 premiere of Super charge. We see some great looks at the Dino Drive mode of the core 6 rangers as well as a new weapon being wielded by Dino Drive Red & Gold. 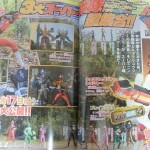 The appearance of monsters from the Zyuden Sentai Kyoryuger soruce footage including Chaos, Demon Torin, & Endorf as well as Bakuryu Sentai Abaranger/Power Ranger Dino Thunder’s Geildon/Zeltrax piques our interest for sure. And we get teases of the upcoming Aqua, Purple, and Graphite (mis-labelled Silver) Rangers! However we have to remember to take all the images with a dose of heavy skepticism. As we well know from previous Super Megaforce teasers, tons of footage that never actually makes it to the final cut of the show can be thrown into these videos. While the content here is indicative of what we could have, it may not be entirely consistent with what we will get. But for now discuss the awesome shots from the upcoming Power Rangers Dino Super Charge!